Advanced Registry Doctor Pro 8.8.8.21 is registry tools software developed by Elcor Software. Advanced Registry Doctor (ARD) will cure your registry and thus provide a better performance of your Windows OS. Lots of programs, including MS Windows itself, have a bad habit to alter the registry in such a way, which causes appearance of different problems. Today you may install some new software on your PC and the next day it may happen that you’ll get annoying error message while your Windows loads. This system utilities software is shareware, which means you can download and use Advanced Registry Doctor Pro 8.8.8.21 for free during the trial period (usually for 30 days). At the expiration of the period you will have to buy the registry tools product for $24.95. Advanced Registry Doctor Pro 8.8.8.21 is available at regnow and Elcor Software website. 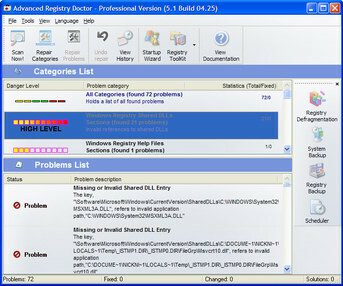 Advanced Registry Doctor Pro 8.8.8.21 supports English, German, Russian, French interface languages and works with Windows 98/XP/Vista. We have tested Advanced Registry Doctor Pro 8.8.8.21 for spyware and adware modules. The software is absolutely safe to install. We has completely tested registry tools software Advanced Registry Doctor Pro 8.8.8.21 many times, written and published the interesting article and uploaded installation file (5041K) to our fast server. Downloading Advanced Registry Doctor Pro 8.8.8.21 will take minute if you use fast ADSL connection. Advanced Registry Doctor Lite 10.12.110.